Tekin and Henn take RD 1 of the RC Pro Series! – Tekin – Smaller, Smarter, Faster! Tekin and Henn take RD 1 of the RC Pro Series! Round 1 kicked off at Ultimate RC in Alvin, Texas. Mother Nature would make an appearance with an Ice storm blowing in cancelling Friday practice. 4 hours of practice would be held on Saturday. Saturday practice was “wet” causing cars to pick up weight, nearly 3 lbs at times! However come qualifying time the track would dry up enough to race on. Due to the practice the program was cut short to 2 qualifiers which allowed Tekin powered Brian “Smiley” Henn to Tq 4wd SC and take 2nd in Pro 1/8 E Buggy. Back on schedule had mains running on Sunday. The track was nice and dry but a little rough due to the weather. First up was 1/8 Pro E buggy where Henn would take A1 battling it out with Jake Dillinger. A2 was much of the same the two battling for the lead however Dillinger would take A2. Due to the reduced schedule only two A’s were ran with the tie breaker coming down to average times, giving Henn the win! Brian chose the Tekin Rx8 Gen2 and Gen2 T8 1900kv to power his HotBodies D8-12e buggy. In Pro 4 SC it was the “Smiley Henn” show with Brian taking both A1 and A2 in dominating fashion. Brian chose the Tekin Rx8 Gen2 and Pro4 HD motor for his TLR SCTe 2.0. 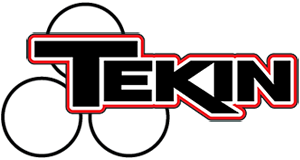 « Tekin cleans up at the Power Stroke Winter Shootout!